Nearly 700 million people worldwide contract mosquito-borne illnesses. Our goal is to knock-down that number, one backyard at a time. 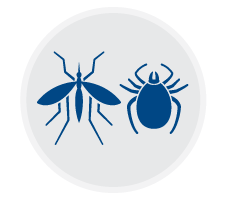 Our mosquito and tick program protects your family and friends from the most annoying and dangerous pests in the world. Mosquitoes show up everywhere: your yard, backyard barbecues, pool parties, and outdoor sporting events. Their bites are annoying, but that's not the worst part. They can also cause dangerous life-threatening diseases. Tick populations have been on the rise and one tick bite has the potential to cause borreliosis, commonly known as Lyme disease. Seasonal protection: Great for families who want to reclaim their backyards for pest-free usage all summer long. One-time treatment: Maintenance just in time for one-time events like backyard parties, weddings, and other outdoor events. A thorough inspection of the property, paying attention to areas and conducive conditions where mosquitoes and ticks can thrive. Recommendations to reduce the conducive conditions, such as keeping your lawn cut low and removing areas of stagnant water. Treatment of high risk areas such as dense vegetation, under patio, eco-tone, and stagnant water. Ready to get a quote? Tap the buttons or fill out the form below.